The CRKT Foresight™ has been a very impressive knife and welcomed addition to our every day carry. Famed knife maker Ken Onion designed the impressive Foresight folding knife for Columbia River Knife & Tool (CRKT). The Foresight assumes a rather muted appearance in contrasting shades of black, but makes a bold introduction with its striking curves, impressive features, and high quality craftsmanship and materials. Optional razor or half-serrated blade edges give users the most popular choices to appease preference, and the amazingly smooth action of the Foresight will absolutely amaze you. The CRKT Foresight™ is an impressive everyday carry (EDC) knife, form-fitted to maximize the grip of the user. The addition of CRKT’s highly touted IKBS™ ball-bearing pivoting system ensures each opening is super smooth with a definitive lockout of the blade. Ken Onion was the youngest knife maker in history to be added to the Blade Magazine Hall of Fame back in 2008, and he has a long list of amazing knives under his belt. The Foresight may just rise above the rest as one of his best creations, and a knife offering strong challenges for any competitor. The CRKT Foresight has been a very nice addition to our knife collection. The CRKT Foresight is a beefy everyday carry (EDC) folding knife with several impressive features. Perhaps the first feature to grab the user’s eye is the ergonomically designed handle. The Foresight handle is curved on its back to more accurately fit the user’s hands during use. In addition, our experience with the Foresight has found this curvature to provide one of the most comfortable grips on the many knives we have tested. The Foresight delivers a 3.5-inch AUS 8 stainless steel blade in an enlarged drop point style. Ken Onion beefs up the heart of the blade by elongating the mid-section of the cutting edge. This elongated section makes the Foresight take on an almost Ghurka Kukri knife appearance, albeit without the angled blade. I am a big fan of drop point blades with this configuration, so I’m showing some bias on the blade configuration. However, I believe the design provides the Foresight some unique cutting angles as well. The blade is coated in a Titanium Nitride finish for extra corrosion protection and a sleek black appearance. The blade comes in traditional razor edge, or a half-serrated blade option as well. Ken Onion selected an AUS 8 stainless steel blade coated in Titanium Nitride for the Foresight. CRKT Foresight has an optional half serrated blade as well, though we prefer the non-serrated. One of the most amazing features of the Foresight is the inclusion of the CRKT IKBS™ ball bearing pivot system. The IKBS ball bearings allow the blade to pivot into an open or closed position as if on a well oiled slide. I cannot emphasize enough how incredibly smooth the Foresight action is with the IKBS system. The IKBS system is mostly enclosed within the handle of the Foresight providing protection from foreign material. There is a flipper on the bottom of the blade extending out through the gap between the handles. Taking on an almost shark fin-like appearance (Onion is from Hawaii) the mildly textured top gives the user plenty of contact for positive assisted opening action. Not to pass over the obvious, Foresight is designed with really impressive swept finger grooves. Unlike most finger grooves that tend to take a 90-degree angle to the grip, Onion provided the Foresight gently swept finger grooves angling back towards the user’s hand. This forms a very natural gripping position for the user’s fingers, and the grooves are wide enough to fit small and larger fingers alike. My medium-sized hands fit very nicely around the Foresight handle, as the knife seemed to mold to the natural curves of my hands. A flipper is added to the Foresight blade to assist with opening. The swept finger grooves on the Foresights handle add grip comfort and placement. Many designers avoid finger grooves, because they are so hard to fit the multitude of grip sizes. By widening and angling the finger grooves on the Foresight, Onion has provided as close as perfect grooved grip as possible. I wonder if he took a mold of clay and simply squeezed his hand onto it to form the basis of the Foresight grip. Regardless, the finger grooves work very well in conjunction with the high angled handle back for a superior grip. To be sure, the grooves are not absolutely perfect. My pinky finger is just a little off from the groove, but barely noticeable. With a proper strong grip, utilizing the thumb for counter pressure on the front back of the handle, the user’s fingers almost naturally glide into the grooves ending with a very comfortable and secure grip. Foresight comes with a simple, but robust locking liner to ensure the blade remains securely locked open when in use. The liner lock is cut to mimic the forefinger finger groove, and is designed with mild teeth to provide ample traction to release the lock without unnecessarily chewing up the user’s finger or thumb. When ready to collapse the blade, the user simply uses their thumb or finger to push the liner to the side and the blade can easily be folded back into place with one finger. The CRKT Foresight finger groove cut liner lock safety is simple to use but robust in application. Holding the CRKT Foresight is very comfortable and secure. Finally, the Foresight uses a shortened pocket clip in a set blade-down position. This may be a sticking point for some users, who prefer more options for personal preference, but it worked out just fine for us. The pocket clip is positioned in the most commonly used method I use for carrying EDC knives, and I really appreciated the truncated length when using the Foresight. Often times a longer pocket clip interferes with, or at least irritates, my master grip on a folding knife when in use. A shorter pocket clip like the one found on the Foresight is completely out of my grip during use, but provides plenty of grip to keep the knife in my pocket during every day carry. 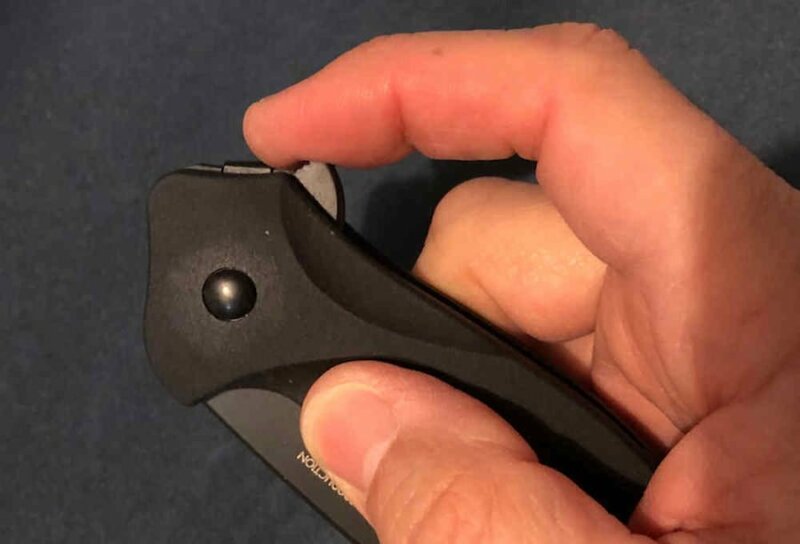 The pocket clip is only about an inch long, and is slightly curved at the opening end to make it even easier to remove the Foresight from a pocket. The truncated pocket clip avoids interference with master grip while still providing plenty of hold. The CRKT Foresight is a very nice EDC knife, and one we have no problem recommending for duty use. The smooth action of the IKBS ball bearing system makes opening the Foresight amazingly easy and smooth. Though not everyone will like the swept finger grooves on the handle, I found them to be large and subtle enough to fit my medium-sized hands just fine. The finger grooves worked very well with the arched back design of the handle, to make this knife seem to mold to my hand. Not only is the design comfortable, it feels very secure when gripped and in use. 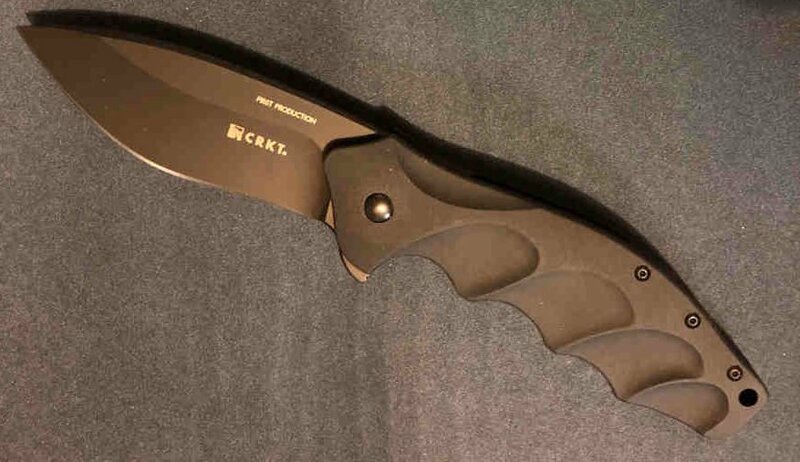 EDITOR’S NOTE: BlueSheepdog does not sell advertising and did not receive the CRKT Foresight pictured in this article with any promises for a good review. In fact, we simply bought the Foresight as any other customer. This allows us to provide honest, and objective reviews. We do participate in the several affiliate programs from distributors, with the embedded links contained within this article. Purchases from these links literally pay to keep BlueSheepdog.com in business.